Twenty two years ago the Global Community organization was created. Today the world is seeing the amazing accomplishments of the Global Community. Back in 1985, I remember having accomplished my first 'soft activism'. It was such a memorable day for me as I actually stood up for a worthy cause: humanity, all life on Earth, and the protection of the global life-support systems. Being a scientist I extended my principles to include standing up for them in public. This was in Calgary, Alberta, Canada. And the day was October 29. I was born again that day! Standing up for what I believed in very strongly! I produced a brochure explaining everything I stood up for. Those who know me can easily imagine how meticulously long the brochure may have been. Then I went to the University of Calgary campus and distributed the brochure to anyone I met. I also posted the brochure on bulletin boards. City Hall and several other public places got my message. I was very proud of having done it. My first very intense exploration of my own capability of reaching out to others and standing up for workable sound solutions to global problems. That day I became one with myself and all life on Earth. I became 'a Global Community'. From there on I produced countless brochures and investigative reports; organized public seminars; and I was invited to give talks in schools. There was so much interest in my teaching that I have decided to research and develop a course on environmental auditing and assessment of properties. A very long course indeed, 8 months long, covering all aspects. I taught the course in a special area of the University of Calgary Library. Although it has cost me plenty, my course was for free, no fees to take it. It was so successful that the federal government of Canada decided to 'buy' my package. Very little money! Then, a year later, it was used to offer a similar package as a special training at the Souhtern Alberta Institute of Technology. The industry was pleased of such initiative. For the first time ever there was a course on the environmental auditing and assessment of properties, land assessment, pollution evaluation, remediation and restoration of building and land, and the protection of the environment. And a year later after that the University of Calgary started its own program also covering all environmental aspects. This experience taught me that if I persevere in standing up for what I strongly believe is right then I will eventually succeed. Later on Global Community WebNet became Global Community WebNet Ltd. which is now the only federally incorporated business I have kept alive over the years. Again back in 1985, I have researched and developed several new global concepts no one had ever thought about. One of them was the expression "the Global Community". As usual, being a scientist, I gave it a long and technical definition. Later on in the 1990's, after having met a marvelous woman whom I married, Virginie, we gave the definition a more popular and easy to grasp meaning. Actually Virginie had a lot to do with this new version. Virginie and I had countless brain-storming exercises in the Rocky Mountains. She and I have defined the Global Community around a given territory, that territory being the planet as a whole, as well as a specific population, which is the Global Community. The Global Community has the power to make the laws of the land and to make the rules for the territory of the Earth. Global Law has been and continue to be researched and developed for this purpose. Conservation, restoration, and management of the Earth resources is about asking ourselves the question of "Who owns the Earth?" The large gap between rich and poor is connected to ownership and control of the planet's land and of all other Earth natural resources.We, the Global Community, must now direct the wealth of the world towards the building of local-to-global economic democracies in order to meet the needs for food, shelter, universal healthcare, education, and employment for all. One of the very powerful tools to communicate our ideas and having everyone to participate in the discussions has been the Global Dialogue. The idea of creating global dialogues was first brought forward in a report on global changes published in 1990 by Germain Dufour. The report contained 450 policies (workable sound solutions) on sustainable development, and was presented to the United Nations, the Government of Canada, the provincial government of Alberta and several non-profit organizations and scientists. There was a need at the time for helping humanity back onto the path of survival this millennium. There is still a need for such help and most likely will continue to be so forever. Global dialogues are the source of new ideas and finding new ways for our survival and taking along with us other lifeforms on the planet. and many more claims. We do own all of the above as ours because we were the first in establishing them, defining them and promoting them on a monthly basis with Newsletters, press releases and letters. Thousands of people and organizations have been using our materials for all kinds of purposes. Many sell T-shirts, flags, etc. with our expressions on them. We have nothing to do with such activities. We never approved of others using our materials without permission. Some even use the expression 'Earth Government' to send blogs over the Internet. That also has nothing to do with us. We dont approve of such disrespectful use of our material. This is the fundamental definition of the expression "Global Community" first defined by myself and my wife Virginie in 1985. This definition includes all people, all life on Earth. It also implicitly says that no-one in particular owns the Earth but we all own it together. Not just us people, but all life on Earth owns it. The beginning of life stretches as far back as 4 billion years, and so Life claims its birthright of ownership of Earth, and so does the Soul of all Life, the Soul of Humanity. Throughout the global dialogues the land ownership of the Earth has meant ownership of the land and of all other Earth natural resources. Following this thinking we see land ownership is no longer a problem. The Earth and all its natural resources belong to all the "global communities" contained therein. A village, or a city is "a global community" and owns the land around its boundaries. Along with the Global Community, it has ownership of all natural resources within its boundaries. As mentioned above, land here, by definition, covers all naturally occurring resources like surface land, the air, minerals deposits (gold, oil and gas etc), water, electromagnetic spectrum, the trees, fish in the seas and rivers. It is unjust to treat land as private property or a commodity. Land is not a product of labor. Everyone should therefore be given equal access to all natural resources. The Global Community has many expert groups able to begin the necessary intergovernmental negotiations towards establishing alternative revenue sources, which could include fees for the commercial use of the oceans, fees for airplane use of the skies, fees for use of the electromagnetic spectrum, fees levied on foreign exchange transactions, and a tax on carbon content of fuels. And October 29 is a special day to claim that right. Let us celebrate! First of all, Happy 22 nd year Anniversary everyone. 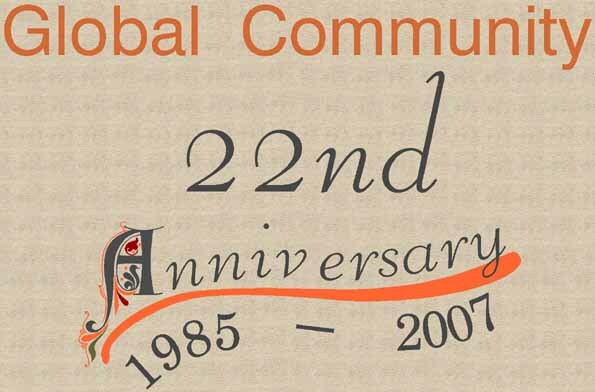 May you all have a very Happy, Healthy, & Prosperous 22 nd year Anniversary of the Global Community.